TeamSupport users spend the majority of their time inside of the Ticket Detail Window. There are many options on this screen for customization as are described below. When you open a ticket, it will open in a new tab along the top of the TeamSupport window. This allows user to multi-task by going back and forth between tickets, and even Customers, Contacts, and Products. + Public Action / + Private Action: Allows you to add a new action to the ticket. + Watercooler Post: Allows you to add a Water Cooler post that will be auto associated to this ticket. Take Ownership: Selecting this button will assign the currently selected ticket to the user. For example, a ticket may be assigned to the Customer Service Group but NOT assigned to a specific individual. The Take Ownership button is a quick way for users to add any ticket to their list and begin working on it. Request Update: Any user can use the Request Update feature which will send the ticket owner an email informing them that the requesting user would like an update to a ticket. This feature is especially nice for managers that notice a ticket has been open and untouched for an unusual amount of time. Merge: This button will give you options for merging two tickets together. Read/Unread: Toggle this option. This will affect the Read/Unread flag on the Ticket Grids. Subscribe/Unsubscribe: Subscriptions are a very powerful feature of TeamSupport. Rather than parties of interest having to run down information about a ticket or a customer, users can simply “subscribe” to tickets/customers and will be notified via email when new Actions occur. Flag/Unflag: Flags or Unflags a ticket in any ticket grid view which you can then sort to easily find tickets you have flagged for follow up. Flagged tickets also appear under the “Flagged” tab on your ticket grid. Ticket Number: This is the automatic number which is given to each ticket. History: This option will display every action taken on a given ticket. You are given the date and time stamp, who performed the action, and what action took place. Print: Formats the view so the ticket may be printed through your browser. Email Ticket: The public actions within a ticket can be emailed to one or more recipients. URL: Will display the URL of the ticket so that you can share it with another co-worker. 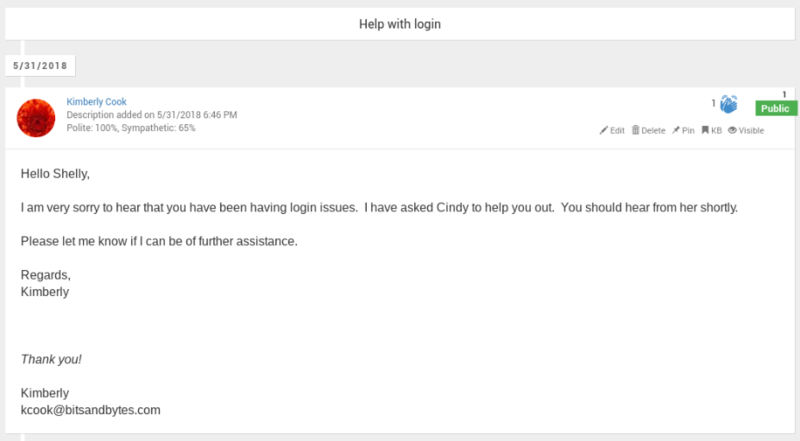 This cannot be used to send to a customer or any other non-TeamSupport user. This is an internal function only. Filter: These toggle buttons will allow you to filter the action results for this ticket between Public comments, Private comments, and Water Cooler posts. If you toggle off one of these buttons, the results will not display in the results list. Clone: This option makes branching out from a ticket easy by copying settings from one ticket into a second ticket. Also, if you generate similar tickets repeatedly, you may create template tickets and generate a copy whenever needed. You will be able to confirm the clone before the ticket is made. The next available ticket number will be used, and the ticket name will be the original ticket name plus (Clone) appended. Delete: Deletes the selected ticket. Only Administrators can perform this action. Ticket Name: Lists the current ticket name. If the ticket was from created email, this is the subject of the email. This field can be edited by clicking on the field and then clicking Save. The Action Windows provide important information for the actions which have been added to the ticket. Actions are added inline where the newest action is listed at the top by default. Timeline: The date of the action will be displayed in a blue box to help acclimate the user to the timeline of the actions. Actor: Lists who actually created the action. Action Type: This is a customized list to indicate the type of action. The first action in a ticket is always labeled as “Description”. Sentiment: Lists the sentiments that were detected in body of the action. Applause: Team members can encourage each other by applauding their Ticket Actions. Action Description: The body of the email, or the action description, includes any screen recordings and pasted images. Action Number: The number in the upper right hand corner of the action box indicates the order in which the action was logged. Private/Public Flag: Toggle this flag to mark the action as Visible, or Not Visible to customers. Click here to learn more about action visibility. Edit: Click the button to edit the action. Users rights control which actions users may edit. Delete: Deletes the selected action. Users rights control which actions users may delete. Pin: By clicking this button, all users will see this action pinned to the top of the actions list. A pin indicator will appear in the top left hand corner of the action. Knowledge Base Status: Indicates if an action is visible on the Knowledge Base. The ticket must be set up properly for actions to be displayed on the Customer Knowledge Base. Click here to learn more about Knowledge Base setup. Open Eye/Closed Eye Icon: Indicates Action visibility. By clicking on the eye, you can toggle between visible and not visible to customers. Click here to learn more about action visibility. Furthermore Enterprise customers may add additional sections to the ticket page using Ticket Widgets. Widgets use HTML and Java Script to add customization, pop-up boxes, and can pull in native or external data to display on the right side of the ticket. Assigned User: Indicates the user who is currently assigned to the ticket. Group: Indicates the group who is currently assigned to the ticket. Type: Indicates the Ticket Type that is currently selected for the ticket. Status: Indicates the Ticket Status that is currently selected for the ticket. Severity: Indicates the Ticket Severity that is currently selected for the ticket. 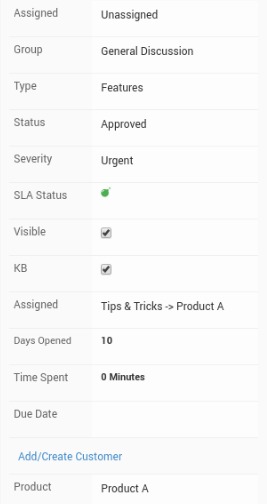 SLA Status: Has several indicators to show the current SLA Status. Sentiment: Indicates the sentiment score of the Ticket. KB Category: Indicates the selected Knowledge Base Category. This is only visible when “Knowledgebase” is “Yes”. Community: Indicates the currently assigned category for Community (Forum). Days Opened: Indicates the number of days the ticket has been open. Total Time Spent: Total time spent on the entire ticket based on aggregate time spent on each action. Due Date: You can indicate the date in which the ticket is due. When the ticket becomes due, this field will be displayed with red text and surrounded by a red box. Due Dates are displayed on applicable Calendar views. You can also change due dates on more than one ticket at once from the Ticket Grids. Customers: Add a new or existing customer to a ticket. Custom Fields: Displays any custom fields in their designated category for this ticket along with their selected values. Product: Add and View Product associated to a ticket. Reported: Add and View Reported Versions associated to a ticket. Resolved: Add and View Resolved Versions associated to a ticket. Inventory: Add and View Inventory associated to a ticket. Tags: Add a new or existing tag to a ticket. Reminders or Tasks: Add and view your own Reminders or Tasks on a ticket. Reminders are found in Support Desk Edition, while Tasks are found in Enterprise Edition. Associated Tickets: Associate a related ticket to the current ticket. User Queues: Add and View the users who have the selected ticket in their User Queue. Subscribed Users: Add and View the users who are subscribed to the selected ticket. Jira: View, Create new, or Associate an existing Jira ticket to the selected ticket. 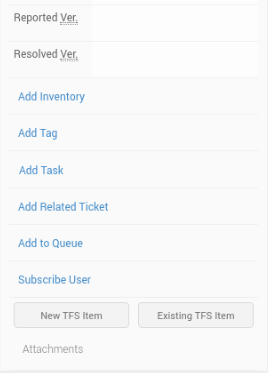 TFS: View, Create new, or Associate an existing TFS ticket to the selected ticket. File Attachments: The file attachments on a ticket are consolidated on the right hand side of the ticket for your convenience.